Thousands of people living in the continental United States and U.S. territories are infected with Zika virus, but many Americans continue to hold mistaken beliefs about Zika, how it is transmitted, what risks it poses, and what can and should be done to protect against it. In an effort to address the public need for accurate and important information about Zika, the Annenberg Public Policy Center (APPC) of the University of Pennsylvania has released “A Guide to Effective Zika Coverage,” a free, downloadable PDF that sets out best practices and examples for broadcasters, reporters, editors and writers covering the Zika outbreak. The guide aims to help the media provide essential information to the public and policymakers so that they can better understand the virus and its health risks. 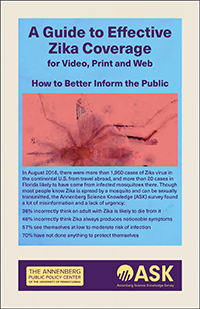 While 79 percent of U.S. adults are familiar with news reports about Zika, 70 percent have not taken any steps to protect themselves from it, according to the Annenberg Science Knowledge (ASK) survey conducted August 4-8, 2016. The Centers for Disease Control and Prevention (CDC) advises taking steps to prevent Zika, especially among pregnant women, who are most at risk because the virus can be transmitted to the fetus, causing microcephaly and other severe fetal brain defects. “At a minimum, media stories about Zika should contain a link to the CDC’s prevention guidelines,” said APPC director Kathleen Hall Jamieson, who directs the ASK survey and Zika project. 28 percent of the public incorrectly thinks that, according to scientists, you are likely to get Zika if someone who has it sneezes or coughs on you (Zika is usually transmitted by a bite from an infected mosquito, or it can be sexually transmitted, according to the CDC). There are more than 1,950 continental U.S. cases of Zika reported, mostly from travel abroad, and 6,600 cases in U.S. territories, including Puerto Rico, according to the CDC. Florida officials have identified over 20 locally transmitted cases thought to have come from infected mosquitoes. Visualize prevention, showing behaviors that prevent the spread of Zika. The guide also includes medium-specific recommendations, like using photo captions in print and background visuals on TV to convey information about prevention and transmission, and aggregating coverage online. The guide to Zika coverage can be viewed and downloaded here. The Annenberg Science Knowledge survey cited in the media guide and this news release was conducted by phone from August 4-8, 2016 among 1,470 U.S. adults by the research firm SSRS for the Annenberg Public Policy Center. It has a margin of error of +/- 3.6 percentage points. For the data, click here. The ASK survey, conducted since February, tracks public knowledge about Zika and other science issues related to public policy. It is directed by Jamieson and managed by APPC managing director of survey research Ken Winneg.